Boat with up to 700 migrants on board capsizes, only 28 survivors reported • 24 corpses to be brought to Malta • EU foreign ministers to convene to discuss Mediterranean migration issue tomorrow • Maltese, Italian, Greek PMs urge EU to take action • EC President says EU has a 'moral obligation to act'. Maltese Prime Minister Joseph Muscat and Italian Prime Minister have made a joint call for an urgent EU summit following a shipwreck off Lampedusa that is believed to have claimed the lives of some 700 migrants. Muscat and Renzi will hold an urgent meeting in Rome tomorrow to discuss the way forward with regards the Mediterranean’s migration issue. EU foreign ministers will also discuss the issue in a meeting in Luxembourg tomorrow. According to reports, a vessel carrying “between 500 and 700 migrants” capsized around 120 miles south of Lampedusa. The BBC reported that the emergency was declared some time around midnight. During the night, the Malta Armed Forces were asked to assist an Italian search-and-rescue mission off the Libyan coast. Reports state that a merchant ship came across the boat towards midnight and tried to carry out a rescue. However, the migrants panicked as they hadn’t recognized that the vessel was there to help them. They rocked the boat with movement, and it overturned. Renzi told a press conference that an Italian vessel involved in search-and-rescue mission has picked up 28 survivors and 24 corpses, and that the corpses are to be brought to Malta. Home Affairs Minister Carmelo Abela later confirmed this statement, adding that the 28 immigrants will continue on their way to Italy. “We have to solve this problem, even in our country where people tend to consider these people as blacks (suwed), and not give them enough attention,” Muscat said at the beginning of his speech during a political activity to celebrate the Labour Party’s local council election victory. “Children men, and women have died. Although we are seeing encouraging signs from European politicians, action must be taken. There is a tragedy going on in the Mediterranean. A time will come when Europe will be judged as harshly for its inaction as it was judged when it had turned a blind eye to genocide. Talking to the BBC World, Muscat said that Europe had to react to solve this situation, starting with addressing the crisis in Libya. Opposition leader Simon Busuttil referred to the tragedy during a political activity earlier today and appealed to the government to give its assistance and ensure that as many lives as possible could be saved. He also urged the government to secure talks with the EU and pledged his support to such talks. Greek Prime Minister Alexis Tsipras also urged the EU to urgently come up with a plan to tackle a mounting migrant humanitarian crisis in the Mediterranean, and to support member states that are bearing the brunt of migration waves. “The Mediterranean must stop being a graveyard sea and southern European countries a storage of human souls,” Tsipras said in a televised address. 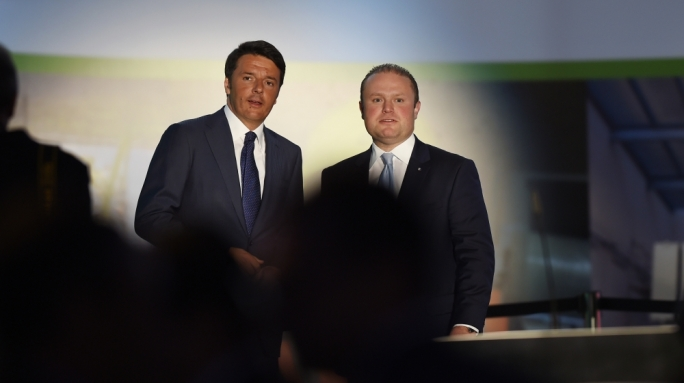 In a brief tweet, Renzi said that he will continue working with Muscat, while they wait for an extraordinary EU summit to take place. Contacted by the BBC, Nationalist MEP Roberta Metsola said that this humanitarian crisis needed to stop. “This is a European issue and it therefore requires a European solution, and tweeted condolences are not enough,” Metsola said, urging European member states to act in order to avoid these tragedies that have become all too common in the Mediterranean. “We need the political will of all 28 member states, especially in view of the deteriorating situation in Libya which is causing so many immigrants to lose their lives in their perillous journey towards Europe,” Metsola said. EU Ministers to meet over potentially the greatest tragedy which has happened in the Mediterranean in recent years. Proactive Malta. Those dying in the Mediterranean are some of the poorest men, women and children in the world. We must act to stop these awful scenes. Home Affairs Minister Carmelo Abela warned that a “human tragedy” is unfolding in the Mediterranean. “Nobody should allow this tragedy to go on for any longer,” Abela said. Labour MP Deborah Schembri said that such tragedies were “the fruit of a lack of EU policies”. She said that the Maltese government is tackling this problem to the best of its ability, but warned that Malta is too small to solve it all by itself. Meanwhile President of the European Commission Jean Claude Juncker tweeted that the European Commission was deeply chagrined by the reports. The statement explained that the European Commission was currently consulting with member states, European agencies and international organisations in order to prepare a new European Migration Strategy, which would be adopted by the Commission in mid-May. “What we need is immediate actions to prevent further loss of life as well as a comprehensive approach to managing migration better in all its aspects,” the statement read. The statement explained that the only way to truly change the reality is to address the situation at its roots. The statement siad that this was why a large part of the approach being worked on was going to be about working with third countries. European Council President Donald Tusk tweeted that he had spoken with Muscat and that he will hold talks with the European Council, the European Commission, and the European External Action Service on how to alleviate the situation. The case is similar to last week’s incident where some 350 migrants are thought to have lost their lives. The boat carrying around 400 migrants had capsized when they all grouped to one side of the vessel upon seeing another vessel approaching. Following the incident, only around 150 people were rescued, and bodies have since washed up on Libya’s shores. Since the start of the year, at least 900 other migrants are thought to have died crossing the Mediterranean Sea, and in the past week alone, Italy’s coastguard rescued 10,000 migrants whose vessels ran into trouble. Frontex data shows that migration across the Mediterranean in 2014 peaked to a level more than twice as high as its previous peak in 2011, the year of the so-called ‘Arab Spring’. 170,760 migrants crossed the Mediterranean in 2014, compared with 64,300 in 2011, 15,900 in 2012, and 40,000 in 2013.